Your Number One Choice for Landscapers in Coquitlam, Port Coquitlam, Port Moody, Maple Ridge & Pitt Meadows! Our clients include Residential Strata Complexes, Commercial Properties, and Home Owners. We are a member of the British Columbia Landscape & Nursery Association (BCLNA). Our landscaping and gardening services are based on standards provided by the BCLNA. We are a member of of the Tri-Cities Chamber of Commerce and Better Business Bureau with an A+ Rating. ATC Landscape carries $2,000,000 in business liability insurance in addition to Worker’s Compensation Insurance. Our WorkSafe WCB number is 728123. ATC Landscape uses professional landscape equipment (Honda and Stihl). 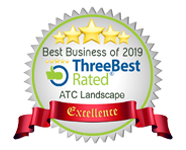 Our staff and vehicles are distinguished by our ATC Landscape apparel and signage. We are committed to 100% customer satisfaction with the services we provide. Proudly serving the Tri-Cities (Coquitlam, Port Coquitlam, Port Moody), Pitt Meadows and Maple Ridge since 2001.